While I try not to have too many expectations of who I expect Harper to be when he grows up, I can't help but hope that he is a geek. Math, Biology, Chemistry, Physics, any of the math or sciences would be lovely. 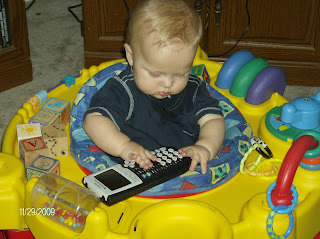 The best I can do is to encourage critical thinking, and give him educational toys. I don't know if its because of the graphing calculator, but he looks a lot older in this picture than when I saw him just a couple weeks ago!